Joe Morganfield receives Key to the Village from Mayor Gunter. On Sun., July 12, there was a Muddy Waters Tribute and 100th Birthday Celebration on the closing night of the 2015 Taste of Westmont. Over 5000 people attended the Sunday event throughout the course of the day. Toni Gunter, Mayor Ron Gunter, State Rep. Patti Bellock. The tribute featured some of Chicago’s best blues artists and ended with a special presentation from Westmont Mayor Ron Gunter to Joe Morganfield, youngest son of Muddy Waters. Mayor Gunter presented Morganfield with the Key to the Village. State Representative Patti Bellock, Westmont Special Events (WSEC) President John Chorney, and WSEC Vice President Bob Reid were also part of the ceremony. After a callout to the Class of ‘83, Joe Morganfield told the audience, “Westmont will always be home to the Morganfield’s.” He thanked the audience and the village for their support of maintaining the musical legacy of his dad, McKinley Morganfield, aka Muddy Waters. Mayor Gunter announced that Muddy Waters had been inducted into the Rhythm & Blues Hall of Fame earlier this year and that a special award was being sent to the Muddy Waters Museum, One S. Cass Ave., Suite 102, in the near future. 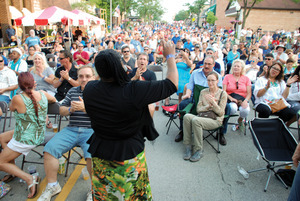 Demetria Taylor sings to a packed house at the Taste. The Muddy Waters Tribute featured an open mic blues jam from 12pm to 4pm. More than 50 musicians of all ages (10 years old to 70 plus) and abilities (one of the bassists for the jam had only been playing for six months) had a chance to get up on stage and play alongside some of Chicago’s greatest musicians. Then in the evening, the night was kicked off with Rick Kreher, Muddy Waters’ former guitarist and bandleader, as he led the group through the tribute. The line-up included Milwaukee Slim, Toronzo Cannon, Mike Wheeler, Demetria Taylor, Eddie Taylor Jr., Tom Holland, Omar Coleman, “Big Dog” Mercer, Brother John Kattke, J.B. Ritchie, Larry Williams, Pooky Styx, TY Drums, and more. Additional photos and videos from the event can be found on the village website—westmont.illinois.gov. The Westmont EIC is committed to promoting all things “green”. In the next few months, the Commission has scheduled several presentations that will be held at the Village Hall. The programs will be recorded and played back on cable ch. 6 as well as YouTube. The public is invited to attend in person as well. On Tues., Aug. 18, 6 p.m., SCARCE, School & Community Assistance for Recycling and Composting Education, will present on a host of topics including energy conservation, water conservation, pumpkin composting, cooking oil recycling, and more. SCARCE’s mission is to inspire people, through education, to preserve and care for the Earth’s natural resources, while working to build sustainable communities. For more info, visit their website scarce.org. On Mon., Sept. 14, 6 p.m., Chef Sean Patrick Curry from the Chicago-Oakbrook Hilton will give a presentation regarding his bee-keeping program at the hotel and how his 40,000 employees help provide something sweet and healthy for guests to the hotel. For more info, contact the Village at info@westmont.il.gov or 630-417-0280. 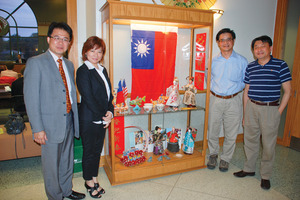 The strong relations between the Village of Westmont and the Taipai Economic and Cultural Organization (TECO) continues to grow as the two groups collaborate on bringing exciting cultural events to Westmont. On Mon., July 20, a Taiwanese Folk Sports Troupe visited Westmont and gave two free presentations at the Westmont Park District Community Center, 75 E. Richmond St. The first presentation was a hands-on, meet the athletes engagement, and the second act was a 90-minute performance consisting of athletic displays of coordination and balance that are unique to Taiwan. These ancient sports, including shuttlecock kicking, diabolo spinning, rope skipping, kite flying, dragon and lion dances, and top spinning, have long been practiced from generation to generation throughout China. Today in Taiwan, these folk sports are extremely popular among students. They can be regarded as gymnastic and recreational activities or held as performances and competitions. pop music and dance, as well as children’s games played in the country. The goal of the exchange is to obtain a better understanding of Chinese and Taiwan aboriginal culture through these performances. 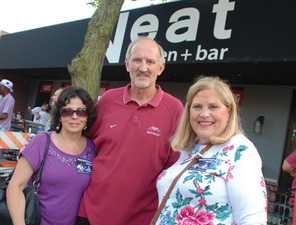 Photos from the event are posted in the photo gallery on the village website at westmont.illinois.gov. Use repellent—When outdoors, especially at dawn and dusk when mosquitoes are most active, use mosquito repellent on skin that is not covered by clothing. Limit outdoor activities at dusk and dawn—Mosquitoes are most active at dawn and dusk—try to limit outdoor activities at these times. If you are outside, cover up as much skin as possible. It’s also recommended to wear light colored long-sleeved shirts, pants, shoes and socks. Eliminate standing water—Eliminate mosquito breeding sites, such as leaking hoses, standing water in tires, plastic containers, watering bowls for pets, and other solid surfaces that hold water, by removing standing water. Make sure windows and screens are secure—Make sure doors and windows have tight fitting screens by repairing or replacing screens that have holes or tears. For more information or to sign up to receive mosquito spraying notifications, please contact Clarke Mosquito at 1-800-942-2555. In 2014, the village approved a street resurfacing plan that will ultimately invest more than $8 million in community road repairs over a three year period. The village is currently in year two of this project. An independent engineering firm, Infrastructure Management Services, Inc., was contracted in 2012 to perform a Laser Dynaflect study of all roadways in the community to create an initial assessment of road repairs. This study, along with Public Works staff recommendations, was used to create the list of streets to be resurfaced during this project. —Williams St. to Fairview Ave.
—Quincy St. to 55th St.
—63rd St. to Aspen Ln. —Alley east of Cass Ave.
For more information regarding Westmont street resurfacing project, please contact Noriel Noriega at 630-981-6295. The Westmont Police Department will once again host the Westmont Citizens Police Academy Program. This nine-week course will be held on Wednesday evenings from 6:30 to 9pm starting Sept. 30 and ending Dec. 2. There will be no class Thanksgiving week. Residents can sign up now through Sept. 23. The purpose of the Citizens Police Academy is to provide participants with a better understanding of the daily operations at the police department. The program offers a hands-on, behind-the-scenes look into various aspects of law enforcement. Participants will have the opportunity to learn about a wide range of police work including SWAT (Special Weapons and Tactics), crime scene investigations, identity theft, information regarding gangs, traffic stops, along with many other interesting police functions. Participants must be 18 years of age or older, live, work or be associated with Westmont. Participants must not have a prior felony arrest/conviction. Background and criminal history checks will be conducted on all applicants. The Westmont Police Department reserves the right to deny any applicant. There is no charge to participate. Citizens can sign up using the online application form on the village website westmont.illinois.gov, or print applications can be picked up at the police department, 500 N. Cass Ave. For more info, contact Deputy Chief Ross Brenza at rbrenza@westmont.il.gov or 630-981-6323. The Westmont Police Department has more than 150 “Slow Down—Save A Life” banners that Westmont residents can pick up at the Police Department. Participants must be Westmont residents and agree to post the small plastic banner on their personal property near the parkway. To make arrangements to pick up the safety signs, contact the police department at 630-981-6300 or stop by the police-fire facility, 500 N. Cass Ave.